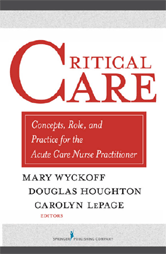 This book defines what it means to be a nurse in critical care. With this text, Acute Care Nurse Practitioners (ACNPs) will learn what to expect in the critical care unit, and how to manage various complications with patients in acute and intensive care settings. Significant emphasis is given to the complex pathophysiology and appropriate management of common problems encountered in the critical care environment, including trauma, infections, and disease. One chapter is also dedicated to the medical, legal, and ethical aspects of critical care. Critical Care is thus the must-have reference for graduate students as well as for practicing ACPNs.